Garmin is taking another swing at the golf watch with its new Approach S60, which takes on a Fenix 5-like design and chucks in plenty of features to track and improve your game. The ageing Garmin Approach S6 has long been one of our best golf watches, and the S60 looks to build on its success, pitching itself as more of a 24/7 wearable. It boasts a large 1.2-inch colour screen, which uses the same 240 x 240 panel as the Fenix 5. We've used the golf mode on the Fenix, and the bigger screen is a real pleasure to use, for taking advantage of features like the green view and hazard yardages – so we're pretty excited about the form factor. You've got over 40,000 courses to view on the round colour display, while still getting access to yardages to greens, hazards and doglegs. While golfers will know how useful accurate yardages to the pin can be, if it's an uphill or downhill shot, there's still some mental maths to be done. A new feature on the Approach S6 called PlaysLike takes elevation into account, and helps you select the correct club. Taking all the fun out of golf? Maybe, but when your handicap comes down, we bet you won't be complaining. There's also a new Garmin Golf app, in addition to Garmin Connect, which remains the go-to app for your stats and scores. In Garmin Golf, you can compete in weekly leaderboards against your golf buddies, and live scores will sync from the watch to the app for each round too. There's no word on whether this will extend to the rest of the Garmin Approach range, but we're working to find out. AutoShot also makes an appearance on the Approach S60, quietly tracking shots around the course, prompting you to tag them with a club, and offering the chance to review them in Garmin Connect afterwards. This hasn't been as perfect as dedicated products like Arccos – nor is the analysis anywhere near as useful – but it's less intrusive than the TomTom Golfer 2 SE. The key differentiator between the old Approach S6 and the newer Approach X40 and S20 was the coaching elements, and they've been further improved here. The Garmin Approach S60 offers SwingTempo and TempoTraining, two features for improving your upswing and downswing posture and tempo. It's hardly going to turn you into Henrik Stenson overnight, but it's good data that's useful down at the range as well as on the course. What's more, you can hook it up to a Garmin TruSwing sensor, to get even more analytics on the wrist. Garmin wants this to be a watch you keep on your wrist when off the golf course too, so it's also loaded it with step, calorie, distance and sleep tracking, which goes hand in hand with the updated look. However, there's no heart rate sensor, as per the Garmin Approach X40, which we found to be an odd choice. But it's not just about golf, and the S60 takes a very Fenix attitude to sports. You can track runs and cycles, as you can with the X40, as well as swimming, skiing, snowboarding, XC skiing and rowing. 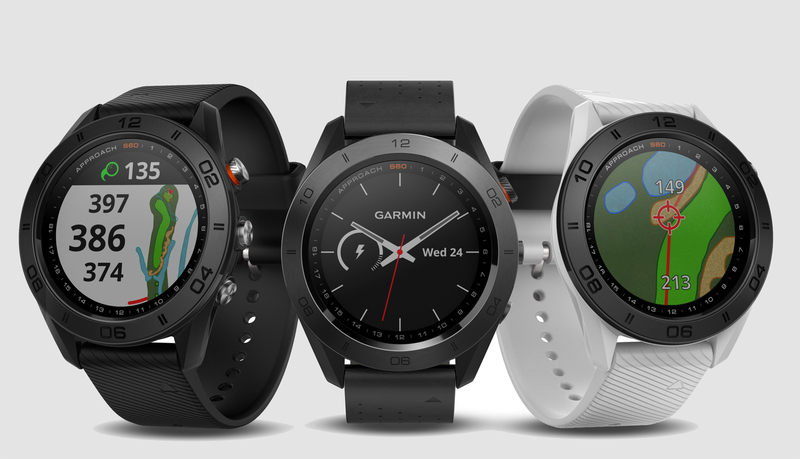 And Garmin says you'll be able to swap the watch's bands for an assortment of styles including those found on the latest Fenix line. It's water resistant to 50 meters too, giving it another reason not to leave your wrist, while Garmin promises 10 hours of battery life when out on the green, and up to ten days when it's just keeping an eye on your steps - and the time. The Approach S60 will be available in June in either black and white for $399.99. There's also a $499.99 premium version that comes in a ceramic bezel, keeping it safer from those pesky scratches.